A simple off-set multi set in the historic market town of Thame, Oxfordshire. It involves looking for information, followed by a short walk to the cache location which is not in the church grounds. This cache is one of 3 Church Micros in Thame, all being at the established churches in the town. They bear the names of the key people in the nativity story from the Bible: Mary, Joseph and (Jesus) Christ. The other churches are St Mary’s Anglican (CM 6854) and St Joseph’s Catholic (CM 6855). For those interested, at the time of publication there were 3 other local Christian churches, but none were able to be in the Church Micro series as their services are not held in a church building. Christ Church Methodist and United Reformed Church was formed in 1972 after many years of it being a Congregational Church. 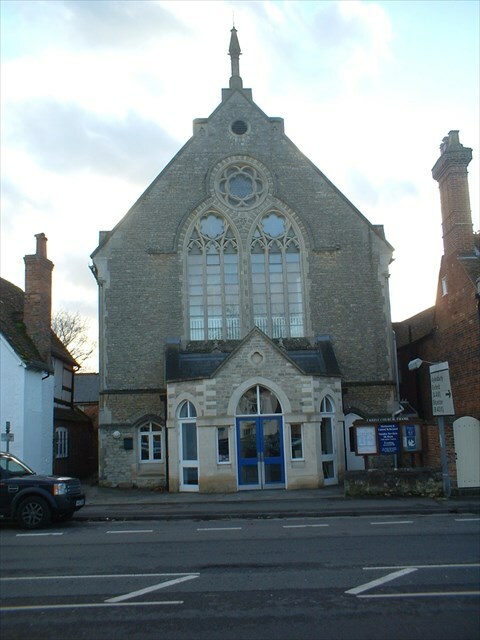 Sunday Services are held weekly at 10.30, but the building is used on other occasions throughout the week. The published co-ordinates take you to the entrance in the Upper High Street, where parking is possible nearby, except on Tuesdays and when street fairs are held in September. The information needed is on the pavement to the left of the church. There are two words at the top of a pole, making a total of 7 letters (one letter is repeated). In the traditional way, convert these to numbers: i.e. A=1, B=2, Z=6, etc., so omitting the first digit for double figure numbers. The container looks like a ballpen top with a lid attached. Please bring your own pencil or pen and some tweezers or something else to prise the logsheet out. If you are short, you may need a bit of help to reach it! If anybody would like to expand to this series please do. We would just ask that you let Sadexploration know first at churchmicro@gmail.com so he can keep track of the church numbers and names to avoid duplication. There is also a Church Micro Stats page found via the Bookmark list. The CO also has caches within easy walking distance: Red Phone Box #46 and Off Yer Trolley – Thame. CONGRATULATIONS happy hunter hp20 for being the FTF!